This article is about the Royal Saudi Navy. For other Royal Navies, see Royal Navy (disambiguation). The Royal Saudi Arabian Navy, sometimes referred to as the Royal Saudi Naval Forces (RSNF), is the naval force of the Kingdom of Saudi Arabia. The Navy has more than 60,000 officers and men, including Marines. The Naval headquarters is in Riyadh. The Western Fleet is based in the Red Sea with the main base at Jeddah. The Eastern Fleet is based in the Persian Gulf with headquarters at Jubail. Other naval facilities were located at Yanbu, Dammam, and Ras Mishab. The modern Saudi Arabian navy was founded in 1957 and began a significant expansion with United States assistance in 1972 aiming to match the Imperial Iranian Navy. Following the Iranian Revolution a further expansion programme, Sawari, was initiated with French assistance. Further vessels were purchased from Britain and France in the 1980s and 1990s. In 1980, U.S. defense contractor Science Applications International Corporation began work with the Royal Saudi Navy to design and integrate the country's own command, control, and communications (C3) centers. Three Al Riyadh-class frigates are modified versions of the La Fayette-class frigate (built by DCN, Lorient). Each has a fully loaded displacement of 4,725 tons, and is armed with eight MBDA Exocet MM40 Block II surface-to-surface missiles (SSM), two eight-cell Sylver vertical launch systems for the Eurosam (MBDA and Thales) Aster 15 surface-to-air missile (SAM), an Oto Melara 76 mm/62 Super Rapid gun, and four 533 mm aft torpedo tubes. The ships are armed with the DCNS F17 heavyweight anti-submarine torpedo. The helicopter deck at the stern has a single landing spot for a medium size helicopter, such as the Eurocopter AS 365 Dauphin or the larger AS 532 Cougar or NH90 helicopters. Four Al Madinah-class frigates based in the Red Sea, built in France (Arsenal de Marine, Lorient (French Government Dockyard and CNIM, La Seyne) in the mid-1980s. Their full load displacement is 2,610 tons and they are armed with eight Otomat surface-to-surface missiles, one 8-cell Crotale surface-to-air missile launcher (26 missiles total), one 100 mm/44 dual purpose gun, two 40 mm anti-aircraft guns, four torpedo tubes, an aft helicopter deck and hangar; one Dauphin helicopter. 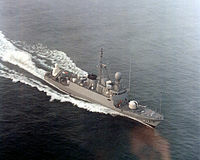 It was believed the Saudis intended to order two new British-built Type 45 destroyers, however production of the destroyers came to an end with no order made. Another destroyer that the Saudis are considering is the American built Arleigh Burke-class destroyer, having been briefed by the US Navy in May 2011 on the acquisition of two destroyers in a package that also includes an unknown number of Littoral Combat Ships. 2 French built Boraida-class replenishment oiler (modified Durance-class replenishment ships built by CN La Ciotat, with a helicopter deck aft and hangars for 2 helicopters. P-8 Poseidon USA Multi-mission Maritime Aircraft P-8A Poseidon 6 Boeing announced it had signed several defense and commercial agreements with Saudi Arabia and intends to order Chinook helicopters and P-8 reconnaissance aircraft. Germany will supply 48 patrol boats to Saudi Arabia within the framework of its border security project, a cost of 1.5 billion euros has been noted for this deal. Lürssen, has already started building 15 patrol vessels for the project's first phase. The patrol boats to be procured under the current contract come in two forms. The first are the 'TNC 35' models, which are 35-meter-long and are propelled by two diesel engines with a combined output of 7,800 kilowatts. The boat can reach speeds of up to 40 knots. The second models, 'FPB 38' are 38-meter-long and can reach speeds of up to 31 knots. As of November 2016 1 TNC 35 has been delivered to Saudi Arabia. Saudi Arabia wants to buy five German submarines for around €2.5 billion ($3.4 billion) and more than two dozen more in the future. In December 2014, the U.S. awarded Lockheed Martin a contract for a Foreign Military Sale of the Mk 41 Vertical Launching System to Saudi Arabia. With no surface ships compatible with the Mk 41 and no plans to acquire a land-based missile defense system, this indicates the country is close to purchasing a VLS-equipped surface combatant. Saudi Arabia has evaluated the Arleigh Burke-class destroyer and the Multi-mission Combat Ship version of the Freedom-class littoral combat ship able to carry a VLS. In October 2015, the US Congress was informed of a possible sale of Multi-Mission Surface Combatant (MMSC) Ships, a variant of the LCS. In July 2018 it was announced that Navantia had signed an agreement with the Royal Saudi Navy for the production of 5 Avante 2000 Corvettes with the last to be delivered by 2022 at a cost of approximately 2 billion Euros. On 30 January 2017 Al-Madinah was attacked by Houthi rebels using a suicide boat, killing 2 sailors and wounding 3 others. The attack took place near the port city of Al Hudaydah, 150 kilometers southwest of the Yemeni capital Sana'a. ^ "Bahrain – McGill School of Computer Science". Archived from the original on 9 October 2016. Retrieved 21 September 2016. ^ "Military Power World". Archived from the original on 20 October 2016. Retrieved 21 September 2016. ^ Zuhur, Sherifa (2011). Saudi Arabia. ABC-CLIO. p. 434. ISBN 9781598845716. Archived from the original on 3 November 2018. Retrieved 11 September 2017. ^ Gray, Matthew (2014). Global Security Watch—Saudi Arabia. ABC-CLIO. p. 41. ISBN 9780313387005. Archived from the original on 3 November 2018. Retrieved 11 September 2017. ^ "Al Riyadh (F3000S Sawari II) Class, Saudi Arabia". www.naval-technology.com. Archived from the original on 8 October 2015. Retrieved 30 October 2015. ^ "Kingdom of Saudi Arabia – Mark V Patrol Boats". Archived from the original on 24 December 2014. Retrieved 24 December 2014. ^ Anthony Capaccio (21 May 2017). "Corporate A-Listers Descend on Riyadh for Trump's CEO Summit". bloomberg. Archived from the original on 21 May 2017. Retrieved 21 May 2017. ^ "Boeing Co signs defense, commercial deals with Saudi Arabia". reuters. 21 May 2017. Archived from the original on 21 May 2017. Retrieved 21 May 2017. ^ "Report: Saudi Arabia Eyes Buying German Submarines". Defense News. Retrieved 24 December 2014. ^ "Saudi Arabia signs deal with Spanish firm for five warships". Arabian Business. 20 July 2018. Archived from the original on 11 September 2018. Retrieved 11 September 2018. ^ Gibbons-Neff, Thomas (6 February 2017). "Video emerges of suicide boat ramming Saudi frigate". The Washington Post. Archived from the original on 6 February 2017. Retrieved 7 February 2017. This page was last edited on 10 April 2019, at 14:38 (UTC).